We are on the home stretch now on this series of reports detailing a recent adventure around Asia. I was heading back home to Melbourne from Hong Kong and unfortunately was unable to secure award seats with Singapore Airlines so I had to settle for Thai Airways instead. Perfectly acceptable really, even though they were only offering angled lie flats for both sectors at the time. 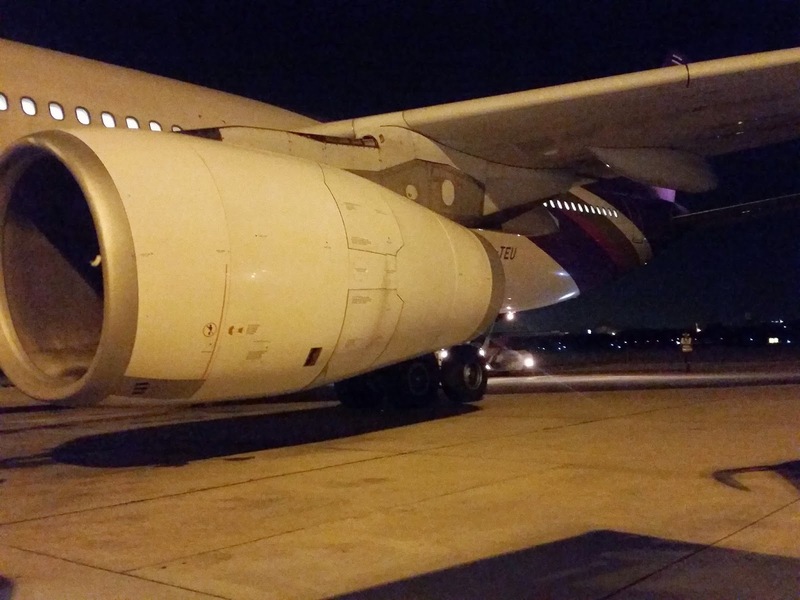 This article is about flight TG639, the 6.55pm flight to Bangkok, the second last of the day for Thai Airways on this route and one of five daily flights. The flight was scheduled to be operated by one of Thai's newer A330's with angled flat seats, the older ones having recliners are mostly used on domestic and less premium routes now. I arrived at the airport nice and early on the airport train, I had checked in at the city terminal so my bags were already sent and my boarding pass issued. This meant I could proceed immediately through terminal 1 immigration, avoiding Thai's terminal 2 check-in facility. Once through I headed over to the newly renovated Singapore Krisflyer lounge where I was welcomed despite having a Thai boarding pass. Barman recommends a Singapore Sling - don't mind if I do! As mentioned by the lounge staff on entrance, do not expect a boarding call for your flight if it is not Singapore Airlines, and the FIDS only shows SQ flights too, so keep an eye on your watch. I loved the new lounge, it was a massive improvement on the old one, especially since it now featured toilets and showers! Those were actually not there before the renovations and you were forced to use the PUBLIC TOILETS! (gasp!!). Things are definitely now much more up to Singapore Airlines high standards. The singapore sling was great and there was an impressive range of hot food and snacks too. After numerous cocktails I headed over to the Thai lounge which was near the departing gate and was somewhere I could hang around at until boarding was actually called. Unfortunately it's still a bit dull and uninteresting, but I do like the openness of it. More seating in the lounge! Eventually TG639 to Bangkok was called for boarding and I headed downstairs, the gate was just a short stroll away. In moments I was welcomed with a friendly 'wai' and headed to my window seat in row 14 (actually row 3 since business starts at 11 and there is no unlucky 13). The menu's were distributed and orders for the main course were taken on the ground. Thai still does a full service meal on this route including starter, main, cheese AND dessert. 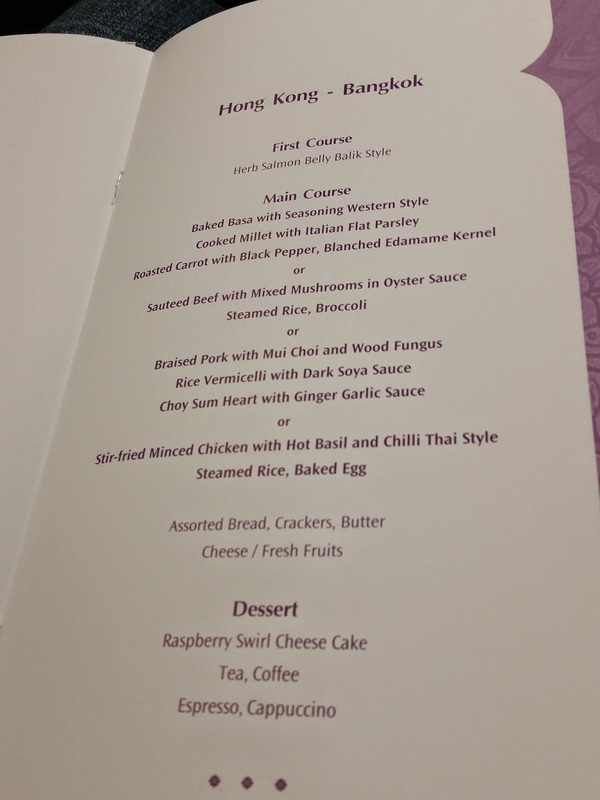 It is served in separate courses, quite impressive for a flight that is just over 2 hours. It's a significantly better offering than what Cathay offers on this route which is served on a single tray. We departed the gate about 15 minutes behind schedule at 7.10pm. We were soon taking off into the night sky and setting course for Bangkok. There was a bit of cloud about which meant the seatbelt sign stayed on for a little while after takeoff. I reclined my seat and relaxed. Thai still do a full beverage trolley drinks run, even on these short regional flights. It's all quite elaborate really and I like it! I ordered a glass of champagne and a perrier, the can was left with me which I prefer. There were also almonds served in a plastic packet. I've mentioned this before on my flight reports but I think in business class nuts should always be served in a proper bowl and not in a packet. Although I'm not going to demand we return the gate and have the flight attendant offloaded if it isn't!! Once again, predictable Thai Airways serves a salmon starter. Do Thai Airways think everybody wants salmon every time they fly with them?? I certainly don't! Please give us a choice of starter Thai, salmon every flight is driving me crazy. At least it was presented nicely and there was some decent garlic bread to go along with it. Thai have a slightly different style of crockery for use on long haul business class, but on regional flights it's still the same old style, i.e. identical to economy for the main course. At least the beef was quite tasty. With dinner over there was a little under an hour to run to Bangkok. I ordered a cappuccino, knowing that a coffee fix would be needed to keep me going for the next flight to Melbourne. The crew were great on this sector, really friendly and attentive. I had regular drink topups throughout the flight. I appreciate that Thai do offer a full 4 course meal on this flight, but there are a few disappointments. Firstly, the salmon starter is boring - there should be a choice of 2 starters. Next, the main meals are essentially the same as economy, how about giving us something that presents a little nicer. The other problem with the meal was the measly SINGLE piece of cheap cheese on the fruit and cheese plate, very poor. I'd like to see the new long haul crockery in use on these flights as I think they look a lot nicer. You will see what I mean when I publish part 8, Bangkok to Melbourne. Next up is the final part of this report, Bangkok to Melbourne on Thai. I do reckon the salmon is annoying. But I think Thai has improved quite a bit. Can't wait till your next report. Please use "there" and "their" correctly in your reports.... it will vastly increase your credibility!